I don't believe it. Another new American play on Broadway. That makes four for those of you keeping count. 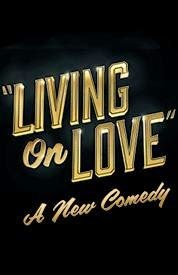 Living On Love which is described as a "comedy with music" is written by Tony Award winner Joe Dipietro (Memphis) and is based on the play Peccadillo by Garson Kanin. Directed by three-time Tony Award winner Kathleen Marshall Living On Love stars legendary opera singer Renee Fleming, Tony nominee Douglas Sills, Emmy nominee Anna Chlumsky and Jerry O'Connell. With a cast and creative team like that it should be good right? Let's hope. Now for those of you who would like to know more about the show here is a brief synopsis about Living On Love for you to peruse. Enjoy! It kind of sounds a little like Lend Me A Tenor which is one of the most hilarious comedies of all time. Let's hope that Living on Love is just as successful. By the way for those of you who want tickets to see Living On Love there is no better time than right now. That's right. From now thru May 24 you can get tickets to see the show at prices that can't be beat. Be advised that while this "Special Offer" is good thru May 24 it is for select seats and as always subject to availability. Get your tickets to see Living On Love on Broadway at the Longacre Theatre. Until next time theatre fans.